Born in Caudete (Spain), Ricardo Mollá studied the Bachelor Degree in the specialty of trombone and composition with Javier García Hernandez and Joan Canet at the Conservatory of Music in Alicante “Oscar Esplá” (Spain); and at the “Hochschule für Musik, Theatre und Medien Hannover” (Germany) with Jonas Bylund. 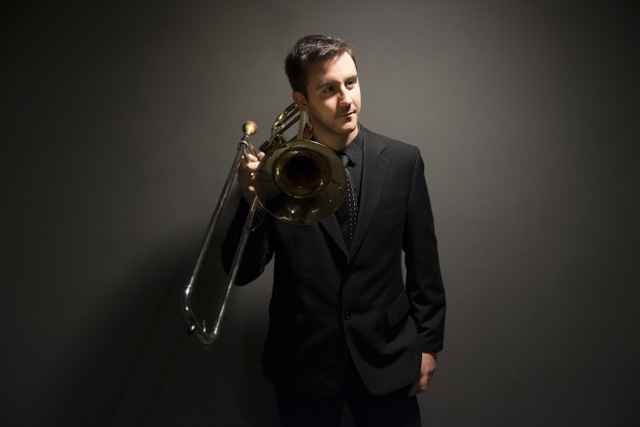 Personally invited by Joseph Alessi, principal trombone of the New York Philarmoniker, he was awarded a scholarship by the Artists’ Society of Spain (AIE) and Foundation JONDE-BBVA to pursue his studies at the prestigious The Juilliard School of New York where he made a Master in Classical Music. Besides this, he has been member of the Spanish Brass Academy with teachers as Guillies Milliere, Indalecio Bonet or Carlos Gil. In addition, he has attended many advanced courses and masterclasses for trombone with teachers as Michel Becquet, Christian Lindberg, Ian Bousfield, Stefan Schulz, Colin Williams, David Rejano, Mark Hampson, Farkas Istvan, Ricardo Casero and so on. Despite his youth, he has been awarded in numerous international competitions: 1st price in the Young National Contest of Spain, 1st prize in the Extraordinary Award of Professional Degree (Spain), 1st prize in the V Young Artists Competition Villa de Caudete (Spain), 1st prize in the XXIII Chapí Ruperto Competition of Villena (Spain), 1st prize at the X National Competition of Spain Brass Wind- Intercenter(Spain), 1st prize in the XV National Contest of Interpretation City of Xativa (Spain), 1st prize in the V Young Performers Competition of Almería (Spain), 1st prize in the “Troisième recontre Internationale de l’IMEP Cuivres” (Belgium), 1st prize in “XI Certamen de Novos Intérpretes Solistas José Varcarcel” (Spain), 1st prize in “Concorso Internationale Citta di Chieri” (Italy), “Best Brass Player” in the “INTERMUSICA International Competition” (Vienna, Austria), 1st price in the competition “Die Hannoversche Börse der Musiktalente” (Germany) and Honorable Mention in the Performance Award 2012 of the Alicante Concert Society (Spain). He has collaborated with professional orchestras such as the Esemble Intercontemporain of París, Hannover Staatsoper Orchester, National Orchestra of Spain, Radiotelevision Orchestra of Spain, Orchestra of Valencia, Madrid Symphony Orchestra (job listings), The Juilliard Orchestra, Alicante Symphony Orchestra, Orchestra of Extremadura, Malaga Philharmonic Orchestra, Philharmonic Orchestra of La Mancha, City of Elche Symphony Orchestra and youth orchestras of Spain (JONDE), Netherlands (NJO), France (ONDJ), Madrid (JORCAM), Valencia (JORVAL), Murcia (OJRM), Catalonia (JONC), Lucerne Festival Academy Orchestra (Switzerland), Gustav Mahler Jeune Orchestra (Reserve) and so on. With these orchestras he has played under the baton of great masters such as Pierre Boulez, Simon Rattle, Alan Gilbert, Matthias Pintscher, Pablo Heras-Casado, David Robertson, Heinz Holliger, Peter Eötvos, Edward Gardner, Lutz Köhler, George Pehlivanian, among many others. With them he has played in some of the major halls of Europe as the Avery Fisher Hall of New York (EEUU), National Auditorium of Spain, Mozart Hall Auditorium of Zaragoza (Spain), Palau de la Música of Valencia (Spain), Lucern Hall (Switzerland), Theatre Basel (Switzerland), Salle Pleyel (Paris), Concertgebouw Hall (Amsterdam), Konzerthaus (Berlin), Cologne Philharmonic Concert Hall (Colonia), etc. His debut as a soloist was at the age of seventeen in the National Auditorium in Madrid (Spain) together with the Chamartín Symphony Orchestra. Since that time he has appeared as soloist with numerous musical ensembles such as the Orchestra of Valencia, the Spanish Radio & Television Orchestra (scheduled during the season 2015-2016), the Symphony Orchestra of Alicante… as well as at prestigious european festivals as Lucerne Festival (Switzerland), Spanish Brass Festival, Manifeste-IRCAM (Paris), International Trombone Festival, Classic Festival (Berlin, Germany), Città di Chieri Festival (Italy), Recontre International des Cuivres (Belgium) and so on. Compagina su realidad como concertista y colaborador de distintas orquestas profesionales mediante la impartición de charlas y labor compositiva a nivel nacional e internacional. Es artista de la prestigiosa marca Antoine Courtois, miembro de Numskull Duo y de The New York Quartet. In the area of composition, he has attended masterclasses by Pièrre Boulez, Heinz Holliger, Matthias Pintscher, Philip Manoury… at the Lucern Festival and the Manifeste-IRCAM (Institut de Recherche et Coordination Acoustique/Musique) in Paris. He currently splits his time between working as an international soloist, composing and giving talks about stage fear. He is an artist of the prestigious brand Antoine Courtois, member of Numskull Duo and The New York Quartet as well.